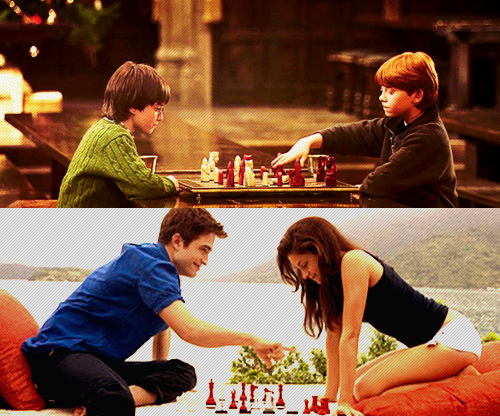 Wizards & Vampire... chess.. Wizards' chess and vampire chess.. Wallpaper and background images in the Harry Potter vs Twilight club tagged: twilight movie harry potter edward cullen bella swan ron weasley chess. This Harry Potter vs Twilight fan art contains brasserie, table à dinner, table à dîner, and antipasto. There might also be dîner, dîner de vacances, repas de fête, salon, séjour, chambre à l'avant, salle, and salle de devant. It's just chess, neither is very exciting.